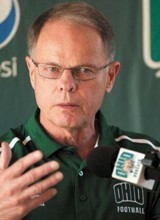 Frank Solich was born September 8, 1944 in Johnstown, Pennsylvania and is the head football coach of the Ohio Bobcats. He also was once a fullback and later the head coach for the University of Nebraska Cornhuskers. Solich's 1999 Nebraska team defeated the University of Texas for the Big XII Conference championship. Solich claimed Big 12 Conference Coach-of-the-Year honors in both 1999 and 2001, and was one of seven finalists for the Paul Bear Bryant National Coach-of-the-Year Award in 2001. For the first five years as head coach, Solich served as his own offensive coordinator, as Osborne had for most of his tenure. His offenses centered on the option. He also devised such plays as the Black 41 Flash Reverse Pass which became a highlight of Eric Crouch's Heisman-winning season in 2001. Successful coaches such as a Frank Solich have led their teams to numerous victories and do what it takes to motivate. The booking agents at AthletePromotions can assist with Frank Solich speaking engagements or corporate appearances. We have years of experience in booking coaching keynote speeches and autograph signings. Booking a coach like Frank Solich is a very easy process. Our agents can provide availability, fees and all costs associated in bringing out a successful coach star to your next corporate event. We can easily find Frank Solichs agent to make this appearance happen. A Frank Solich appearance will add the great speech to your upcoming event, rewarding employees, clients and customers. Most likely, fans and corporations can find Frank Solich's official website, charity involvement, Twitter account, representation, publicist and management info at www.Frank Solich.com.